The world’s biggest maritime city has honoured University of Plymouth for the way it has been supporting businesses and the development of ‘blue technology’. 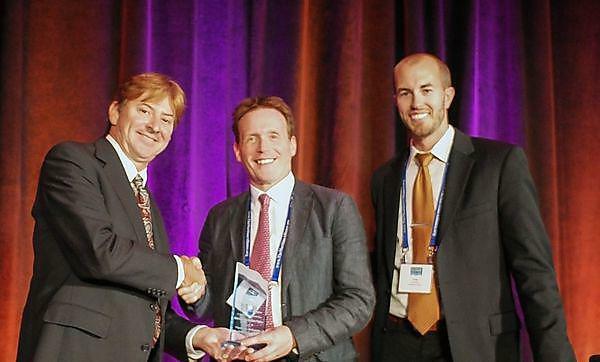 The Maritime Alliance (TMA) in San Diego, California, presented the University’s Marine Institute with its International Maritime Partner Award at its annual Blue Economy & BlueTech Summit last week. Professor Martin Attrill, Director of the Marine Institute, received the award from Todd Barber, Chairman of the Reef Ball Foundation and Greg Murphy, Executive Director of TMA, at the 7th annual gala dinner, at which hundreds of delegates attended from across the global sector. A delegation from Plymouth was part of a South Coast of England Maritime Cluster that travelled to San Diego for the event, including representatives from the Heart of the South West and Solent Local Enterprise Partnerships. It follows the hosting of members of the Maritime Alliance in the region this year, who looked at plans for the ‘blue campus’ at South Yard, and visited the University’s Blue Environmental Hub at Brixham. The bestowing of the International Maritime Partner Award to the University follows on from the award to the National Oceanography Centre in Southampton last year, and Professor Attrill says it could pave the way for a more joined-up approach by the South Coast. “Rather than competing against one another, we can now hopefully continue discussions of a genuine Solent-South West partnership, extending from Plymouth to Portsmouth, which has the largest and most vibrant concentration of BlueTech companies and marine science expertise in the UK,” he said.